The term Talking Head refers to a computer generated animated character, lifelike video character or just a person on a website that is able to talk and hold a conversation with human users. The term Talking Head is typically used by researchers who are engaged in various projects related to human-computer interaction, natural language processing and automated dialogue systems. The term Talking Head is also used by graphic designers working on facial animation and facial expression combined with audio-visual speech processing. The term Talking Head is also used as a chatbot synonym. There are various implementations of Talking Heads present on the Internet which are capable of holding conversations with human beings in natural language. One of them is a chatbot with a Talking Head interface that responds to questions about the weather, as shown on this video. The main feature when creating Talking Heads is lip synchronization. Talking Heads designed by MIRALab at the University of Geneva use virtual heads for simulating interactive talking, as you can see on this video. MIRALab is an interdisciplinary research lab working in domains as Mixed Reality, Personality and Emotion Models, Social Robotics, 3D Medical Simulation, Cultural Heritage, Virtual Humans, 3D multimedia application and simulation of Hair and Clothes. To read more about the rapidly growing international effort to create Talking Heads and its historical antecedents, have look at Talking Heads overview prepared by Haskins Laboratories, an independent, international, multidisciplinary community of researchers conducting basic research on spoken and written language. If you would like to create an animated head for your own Talking Head, try FaceGen Modeller. This tool generates highly realistic or caricatured faces from one or more photographs of any race, gender and adult age group. 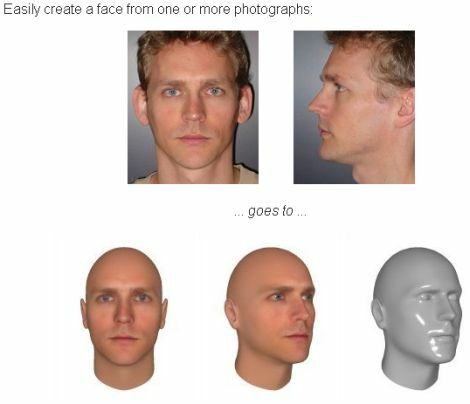 This image shows how you can create a realistic animated face from 1 or 2 of your own pictures. The term Talking Head is a composite of two words: talking and head. The word talking is a gerund form of a verb “talk”, which originates from early XIII century “talken”, probably a diminutive or frequentative form related to Middle English tale - “story,” ultimately from the same source as “tale”, and replacing that word as a verb. The word head is derived from Old English heafod meaning “top of the body”, also “upper end of a slope”, also “chief person, leader, ruler”; from Proto-Germanic khaubuthan (compare with Old Saxon hobid, Old Norse hofuð, Old Frisian haved, German Haupt, Gothic haubiþ), from Proto-Indo-European (the hypothetical reconstructed ancestral language of the Indo-European family) kauput - “head” (compare with Sanskrit kaput, Latin caput - “head”), also “bowl” (as in skull). Modern spelling is early XV century. 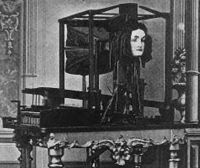 In 1830, German engineer Joseph Faber constructed Euphonia, an artificial Talking Head attached to the front of a series of plates, chambers and an artificial tongue to let it speak. In 1845 Joseph Faber exhibited his “Wonderful Talking Machine” aka Euphonia at the Musical Fund Hall in Philadelphia. This machine consisted of a bizarre-looking face that would speak when Faber manipulated it with foot pedals and a keyboard. The face was controlled by a series of piano keys and pedals which projected 16 basic sounds which could be manipulated in such a manner that it could replicate any European language. Androids, as designed by Hanson Robotics, can be considered as a modern version of artificial Talking Heads. Android Einstein, modelled after the famous theoretical physicist, interacts with humans in a relatively natural, conversational way. As shown on this video, Einstein recognizes a number of human facial expressions and can respond accordingly, making it an unparalleled tool for understanding how both robots and humans perceive emotion, as well as a potential platform for teaching, entertainment, fine arts and even cognitive therapy. Although we use chatbot as the main synonym on this website, please do not be confused. There are more than 161 synonyms in use by academics, business and talking head enthusiasts! It is simply a matter of reading between the lines. Please check out our main directory with 1376 live talking head examples (an overview as maintained by developers themselves), our vendor listing with 256 talking head companies and talking head news section with already more than 370 articles! Our research tab contains lots of papers on talking heads, 1,166 journals on talking heads and 390 books on talking heads. This research section also shows which universities are active in the talking head field, indicates which publishers are publishing journals on humanlike conversational AI and informs about academic events on talking heads. Also, check out our dedicated tab for awards, contest and games related to the talking head field, various forums like our AI forum by talking head enthusiasts and add any talking head as created by yourself and your colleagues to our talking head directory. Please do not forget to register to join us in these exciting times. There are several alternative usages of the term Talking Head which are not connected to artificial intelligence or graphic design fields. Video Spokespersons, Online Spokesperson or Virtual Actors deliver a spokesperson service on the Internet. These Talking Heads can be used to introduce a company, its products and services to website visitors. They appear in an online video presentation to describe complex products or services using video sequences. Such Talking Heads are created by several firms, such as Web Stop, Website Talking Heads or Video Talking Heads. Researchers at the Sony Computer Science Laboratory in Paris, in cooperation with Artificial Intelligence Laboratory at the Vrije Universiteit Brussel, designed multiple Talking Head websites connected with cameras which monitored responses from users worldwide. 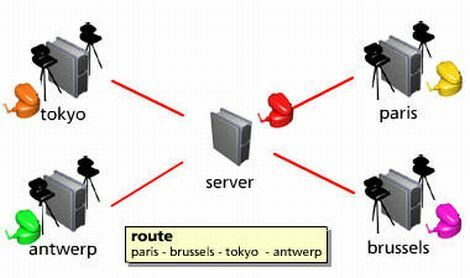 The Talking Heads Experiment featured a network of robotic installations connected through the Internet. At the centre of the network, a dedicated server monitored the progress of the experiment, as presented on this picture. This online experiment explored original hypotheses for each of three domains: semantics, artificial intelligence and human-machine interaction. It included both the human/scientific aspects of the interaction, and the machine/technological aspects. This project is currently dormant (it was active in 1999 and 2000), but you can still take the guided tour to explore the agent world. This tour gives you an overview of the key concepts of the Talking Heads experiment. How to create a Talking Head? If you would like to create your own Talking Head Flash Video, read Creating a Talking-Head Flash Video as written by Tom Green, a professor of interactive multimedia at the Humber College. The term Talking Head also means a person whose talk is empty and pretentious. In television slang, Talking Head signifies a close-up of a person who is talking, especially as a participant in a talk show. Talking Heads is a name of Australian TV program hosted by interviewer Peter Thompson. It gives genuine insight into the world of some of Australia’s most prominent personalities. Talking Heads (originally: Gadające głowy) is a 1980 short documentary film about heads which can talk, directed by Krzysztof Kieślowski. Talking Head is a 1992 movie created by Mamoru Oshii. 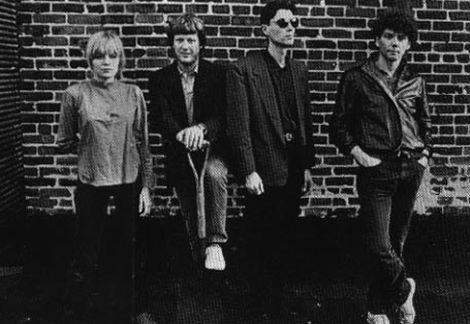 Talking Heads is the name of an American rock band. Talking Heads is the British online community for headteachers, a private, interactive area of National College for School Leadership Online. It facilitates discussion and networking, and provides opportunities to share common problems with other school leaders. Talking Heads is also a name of full service Polish consumer PR agency with blue chip international clients. It specializes in personal finance and new technology market. Talking Heads is a full-service Speaker Agency and Celebrity Management Company specialising in the representation, placement and management of high-profile Speakers and Entertainers.